Tell us a bit about this group. How it got started, when it started and if any the story behind its name? In 2012 many of us were members of various other online groups and in a few posts all agreed that we could benefit from a Canadian group as so many of the discussions and activities were geographically irrelevant to us. Sara Logan and I, both being in Ottawa, had begun trail running together and decided one run to make it happen. We tossed around name ideas (though admittedly I remember none of them) and settled on Canadian Mudd Queens as we wanted to clearly convey 3 things; 1) we were Canadian based, 2) we were mud run/obstacle course race focused and 3) this was to be a women’s only group. We later build The Eh Team as our racing team which includes both men and women. What it is about the sport of OCR that brings the ladies in this group together? I think what brings them “here” is the search for someone who can relate to our experiences! So many of us have expressed having friends and family that just don’t get it. I know I personally have gotten some pretty weird looks on Monday mornings back at the office as I describe my latest race to the poor soul who dared ask “how was your weekend?”. This group provides not only a wealth of knowledge to new, unsure, and nervous racers, but it is also reassurance to us seasoned racers that we aren’t totally crazy for loving this sport! 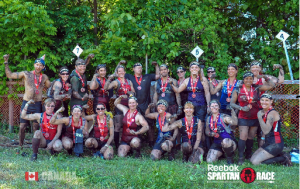 What is the largest group of ladies from the Canadian Mud queens that have been able to get together to do a race? What race is it? Ottawa is definitely our largest group. We are probably about 50 woman in Ottawa total but our largest race team was probably at this year’s Toronto Sprint. It was our Co-founder Tanya’s birthday run and 21 of us actually completed the ENTIRE course together. It’s common to see as many as 30 or more Queens at a single race but never all out there together which made it a truly special day. What was your first / or most favorite OCR to date. 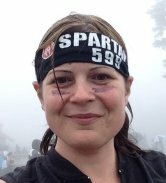 My first ever race was the 2012 Ottawa Spartan. It was love at first finish line and I have since done more than 50. I have so many favorite memories but I think the biggest stand out would be the 2013 Ottawa Beast. I was not at all confident in my ability to finish and found there were many others in the same boat. We formed a team of 9 Queens and took on the unique strategy of NOT RUNNING A SINGLE STEP! We set alarms to stop every hour, eat a small snack, and stretch. We called it our “picnics”. It was a grueling course. It took us 8:33:54 but we all finished. It was a great example of teamwork. Any quick advice for those that are just getting into the sport? Is there a website / facebook page where people can go for more information or to join? The facebook group’s website are https://www.facebook.com/groups/MuddQueens/ for the ladies and https://www.facebook.com/groups/Royalcanadianmuddcourt/ for both men and women. Anything you would like us to know about the Canadian Mud Queens in particular? We don’t bite! We have so many people make comments like “I saw you guys at ____ race but was too shy to say something”. If you see us on the course (you’ll know us by our Eh Team tanks) come say hello, or check us out online. We are more than 500 women, of all fitness levels, and we love sharing this amazing sport with like-minded people like yourselves! In 2013 a handful of us joined the Sears Great Canadian Run, 100k Relay to End Kids Cancer and since then we have raised more than $15,000 for national pediatric cancer research initiatives and the Children's Hospital of Eastern Ontario. We are so thankful for the awesome support of the entire OCR community for making this possible.